One of the main recent advances in cancer therapy is the identification of medications that target specific gene mutations. In 2001 Gleevec was approved to treat patients with the BCR-ABL fusion in chronic myelogenous leukemia (CML), but since then many more drugs have been developed. Currently, there are numerous ongoing trials to identify tumor drivers that can be attacked by a drug. In order to identify the mutations driving a tumor, the tumor needs to be sequenced. There are a range of different approaches for sequencing tumors ranging from the sequencing of a few genes in the tumor up to paired whole-exome sequencing in both the tumor and adjacent normal tissue. Each type of sequencing has benefits and drawbacks and a balance needs to be made between cost and usability of the results. We have developed a clinical workflow for a 50 gene panel that identifies mutations in hotspots in known cancer genes. This workflow uses BaseSpace, VarSeq and N-Of-One to provide insight for our physicians and patients. 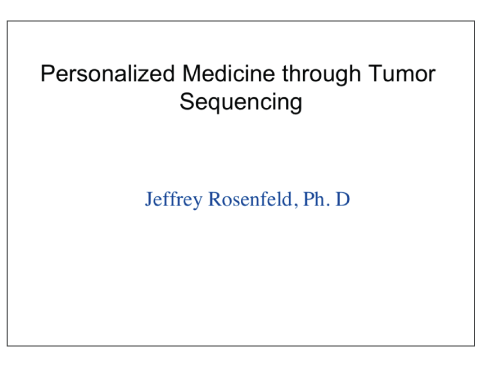 Dr. Jeffrey Rosenfeld completed his doctoral research at Cold Spring Harbor Laboratory where his work focused on histone modification in human cells via the analysis of ChIP-seq data. His work at Cold Spring led to one of the first papers published on ChIP-seq. After completing his doctorate, Rosenfeld moved to Zucker Hillside where he joined Dr. Todd Lencz’s laboratory where he was in charge of all next-generation sequencing analysis at the hospital. His work at Zucker Hillside involved family-based exome sequencing, RNA-seq of cerebrospinal fluid (CSF) and the analysis of genome association data especially in regards to computationally intensive tasks. Rosenfeld also studied the occurrence of multiple nucleotide polymorphisms (MNP) in the human genome and supervised the study of non-traditional human variants such as MNPs and polymorphic SNPs for the 1000 Genomes Project. Today, Dr. Rosenfeld assists researchers and clinicians across Rutgers University and at the CINJ through the High Performance and Research Computing group. Rosenfeld also has a long-standing collaboration with the Museum of Natural History where he and colleagues recently published the bed bug genome.